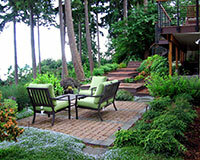 Susie Thompson, APLD, is a Certified Landscape Designer and owner of Susie Landscape Designs, a landscape design firm that has been in business in Seattle, WA, since 2003. 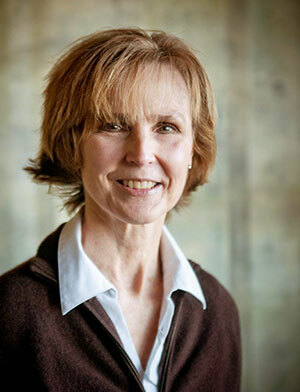 Susie joined APLD in 2003 and has served on the Washington chapter Board since 2008 as an officer and in numerous committee positions, including six years as the Northwest Flower & Garden Show Committee Chair. She is the current APLDWA Chapter President. 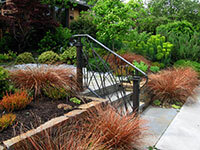 Susie studied landscape design through Anna Gresham Landscape Design School, a full-diploma on-line program that is led by founder and principal Anna Gresham, APLD. 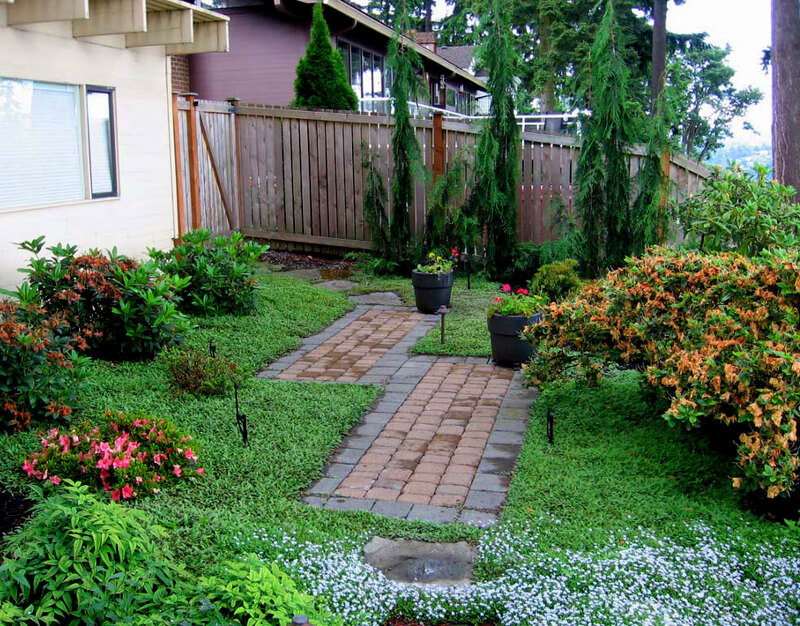 With students and graduates in the United States, Canada, Australia, UK, New Zealand, Europe, India and numerous other countries, the school has become established as an international benchmark for the study of professional landscape and garden design through on-line study. 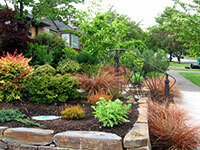 Susie Landscape Designs is a design-only firm. 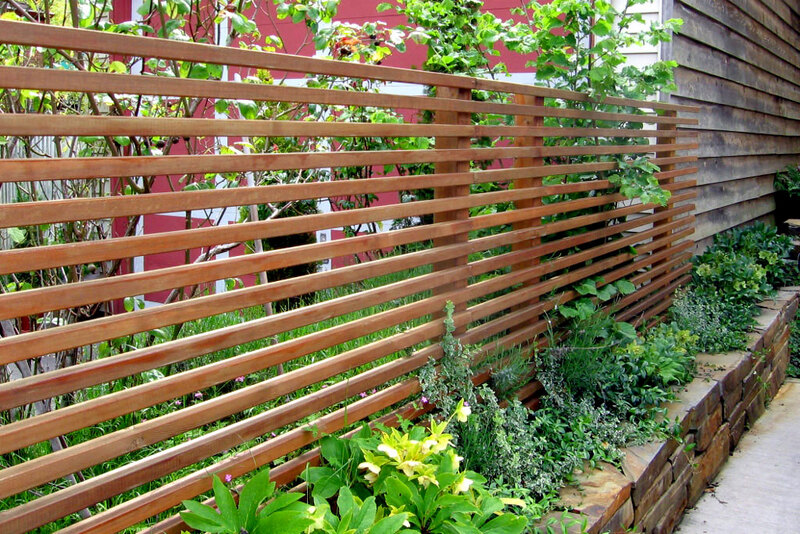 Membership in APLD is Susie’s connection to the high-quality professionals who install her designs and bring them to life for the client. 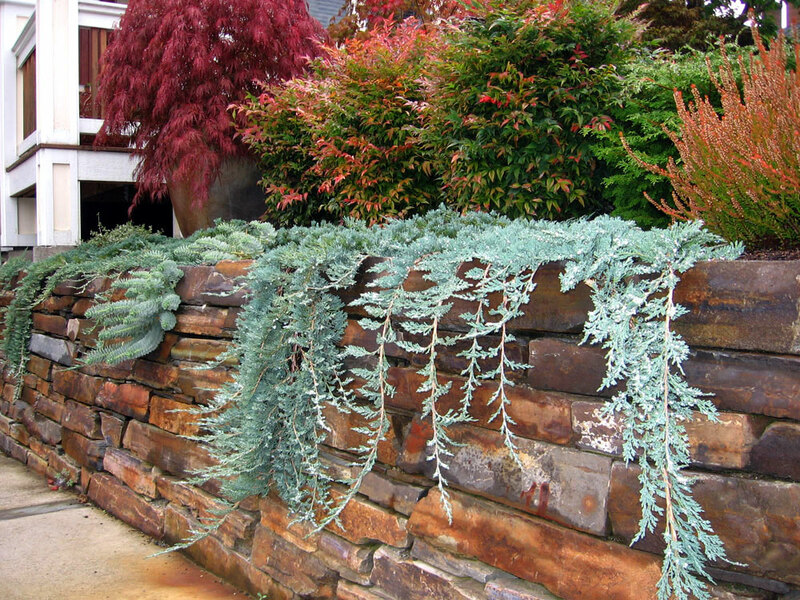 She finds easy inspiration in the natural beauty of the Pacific Northwest and the region’s diverse plant palette, including a beautiful array of conifers. 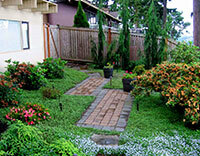 Susie’s designs bring this standard of beauty to every project and blend it with the needs and wishes of the client. 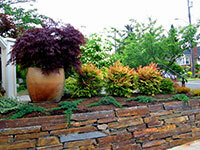 Susie enjoys creating display gardens for APLD at the Northwest Flower & Garden Show and will do so again in 2014 for a sixth time. This annual winter ritual brings together the best of landscape designers, artisans, landscape contractors, and other industry professionals who create extraordinary gardens that push the envelope for creativity and uniqueness. For Susie, creating APLD’s display garden and interacting with the public for the five days of the show is a way to showcase and give back to the organization that supports the professional landscape design industry. 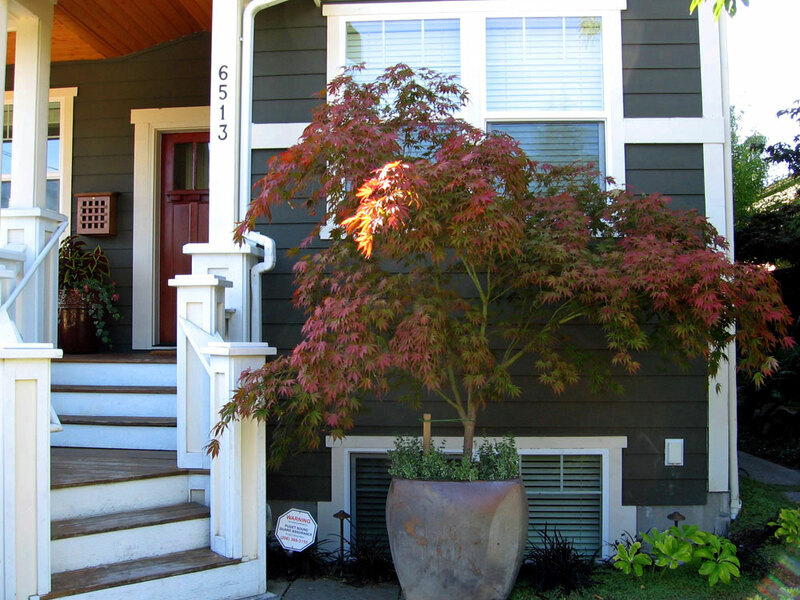 This recently constructed craftsman-style home is located in the vintage 1950s neighborhood of View Ridge. Homeowners Andrew and Dorey Miller loved the architecture of their new home but were keenly aware that the unaddressed landscape needed professional attention. The design challenge was to make the large, two-story house look as if it belonged on this small urban lot, as well as in the neighborhood. The existing landscape, filled with inappropriate plant selections, many of which had expired, was completely demolished, saving only a few choice plants to be relocated. 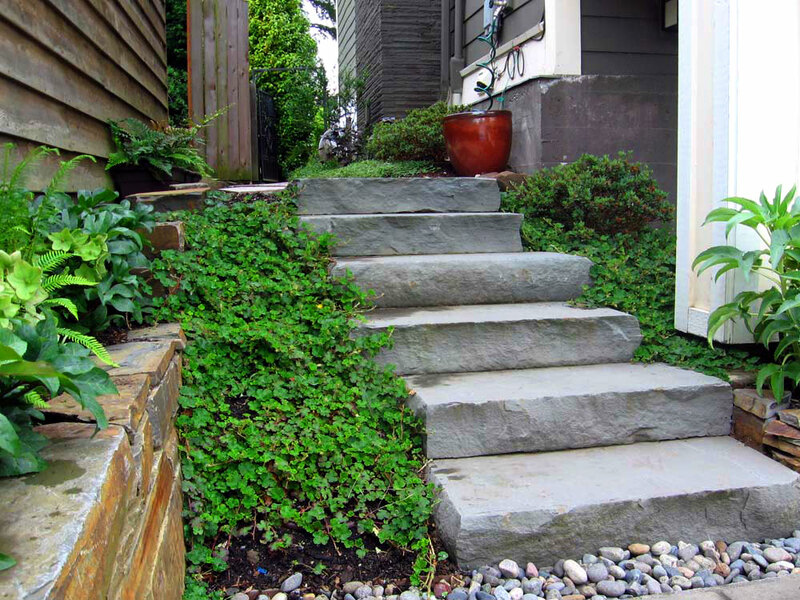 A ledgestone retaining wall of Montana Rustic was constructed to provide level planting areas, define spaces, create an entry from the sidewalk and create a line to comfortably carry the eye across the front of the property. The warm tones in the stone nicely matched the wood trim of the house. A structure was added on the front south side to support vertical plant material; this element repeats the warm tones of the stone and house and provides a visual barrier to the adjacent property. 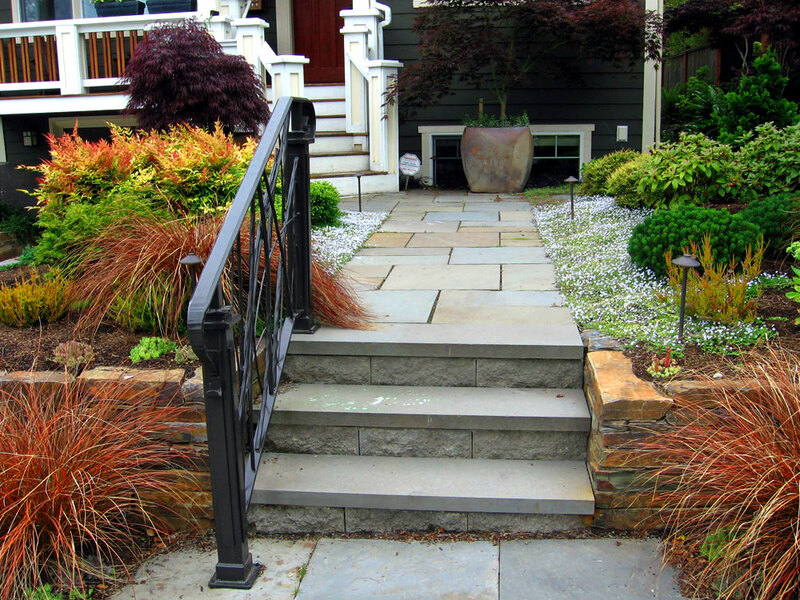 The front risers from the sidewalk and a 1950s narrow front walkway were relocated were removed and replaced with Pennsylvania bluestone squares for walkways and rectangles for stair treads. The bluestone was repeated in the parking strip to frame a new planting bed, and again as trim for a new stained-concrete driveway. Stone is a powerful element in a landscape; holding true to its reputation, the stone wall and bluestone elements unified the house and the yard. Bluestone treads with snap edges also were used to connect the front yard with the south utility walkway leading to the back. 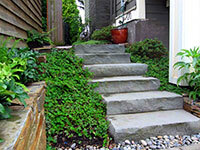 The treads provide a navigable path to transport trash bins to the street. This is Andrew’s favorite new feature in the landscape, underlying the principle of form follows function. 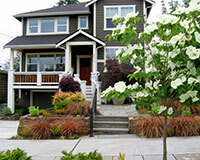 Plant selection was all important to balance the visual weight of the house with the small yard. 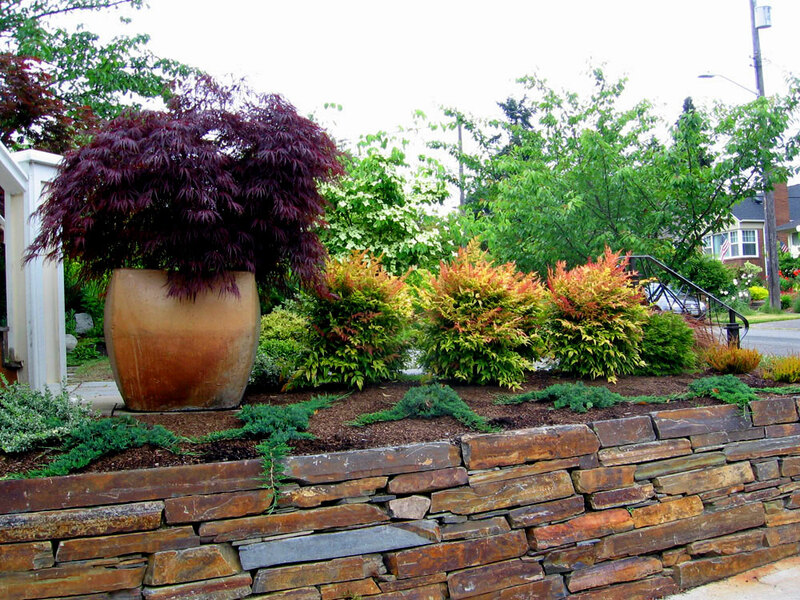 The planting areas are filled with strong foundation plantings that are both colorful and textural —Nandina domestica ‘Gulf Stream’ and conifers such as Cryptomeria japonica ‘Little Diamond’ and Pinus mugo ‘Teeny’. 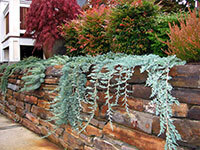 Groundcovers add dimension; Juniperus horizontalis ‘Wiltonii’ trails over the retaining wall. 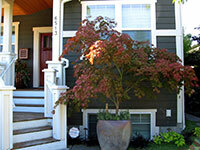 Two maple trees in containers frame the front entry. Landscape lighting enhances evening drama resulting from plant shadows. 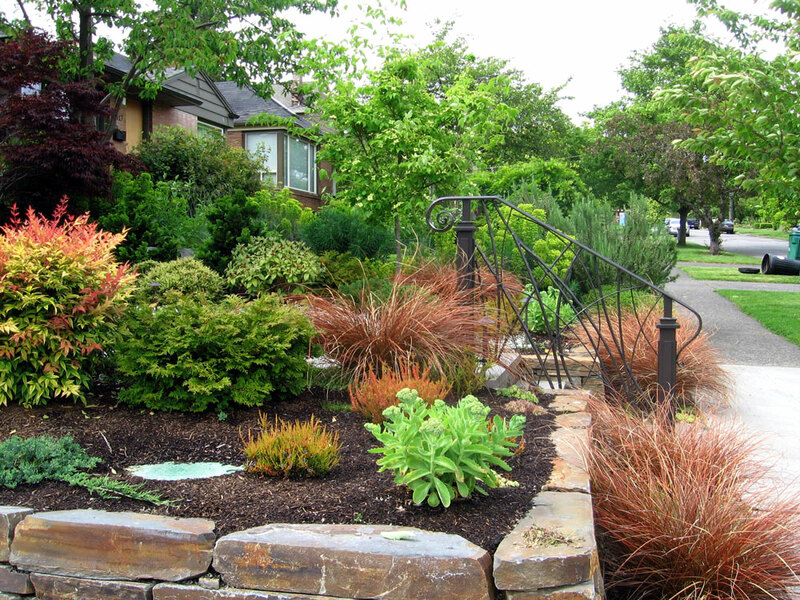 Hellebores, ferns, and Astilbe provide year-round interest in the shade beds, and a colorful tapestry of grasses, heathers and sedum greets you at the sunny front entry. 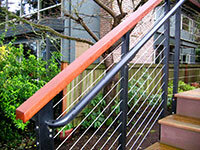 As a finishing touch, a custom wrought iron handrail was fabricated for the front risers. This repeats architectural details of the house and brings an inviting and welcoming artistic element to the front entry. 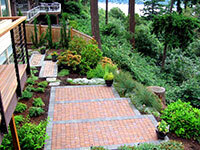 A northwest ranch style home with a sweeping view of Lake Washington was the site for this design challenge. The house sat at the top of a steeply sloped property; the backyard was a narrow terrace, after which the property sloped dramatically toward the lake. Towering conifers that supported an active eagle habitat dominated the landscape. 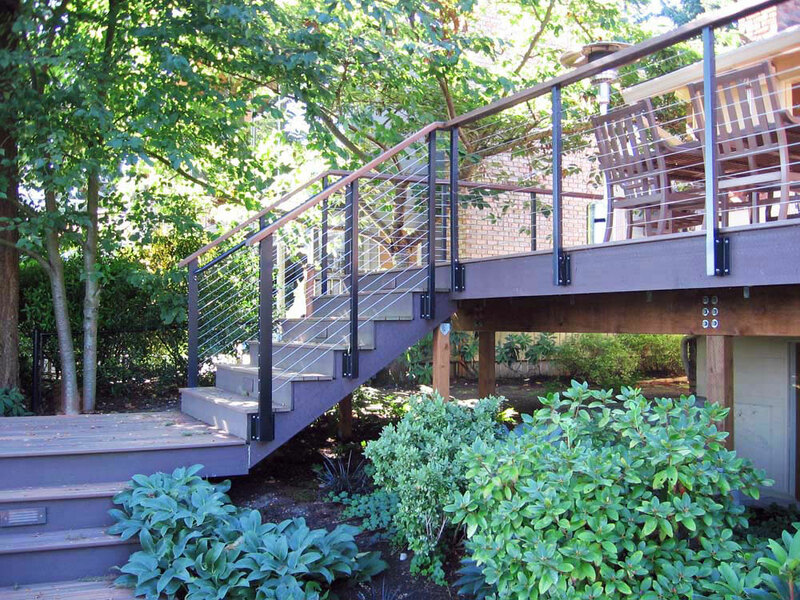 Homeowners Mark Diamond and Debi Perluss wanted to replace the second-story deck, which was beyond its useful and attractive life, and bring the landscape to a level that matched the beauty and functionality of their home. 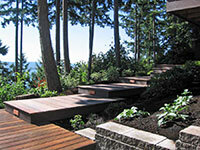 Maintaining the natural, wooded setting was paramount, as was low maintenance, given the couple’s busy schedules. 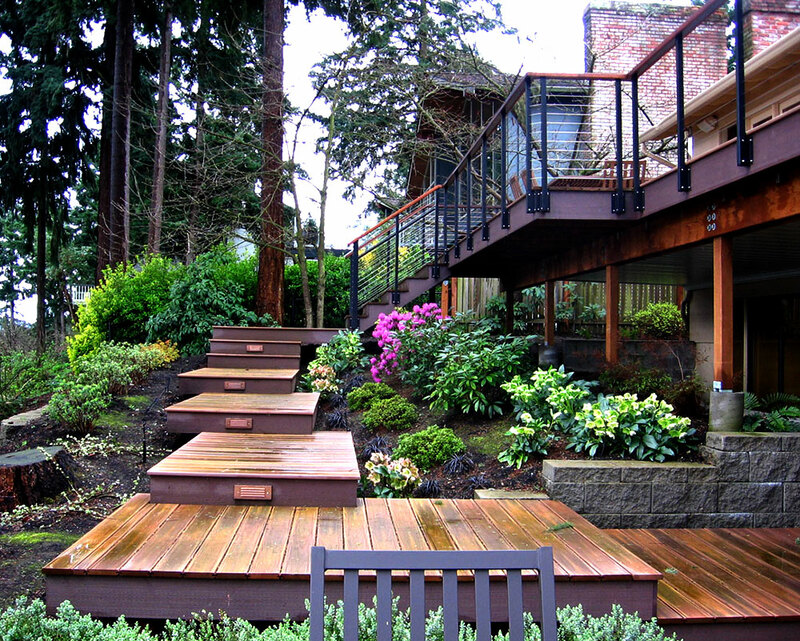 The first hurdle was getting a permit to remove a four-foot-diameter Pseudotsuga menziesii that would have interfered with deck expansion. 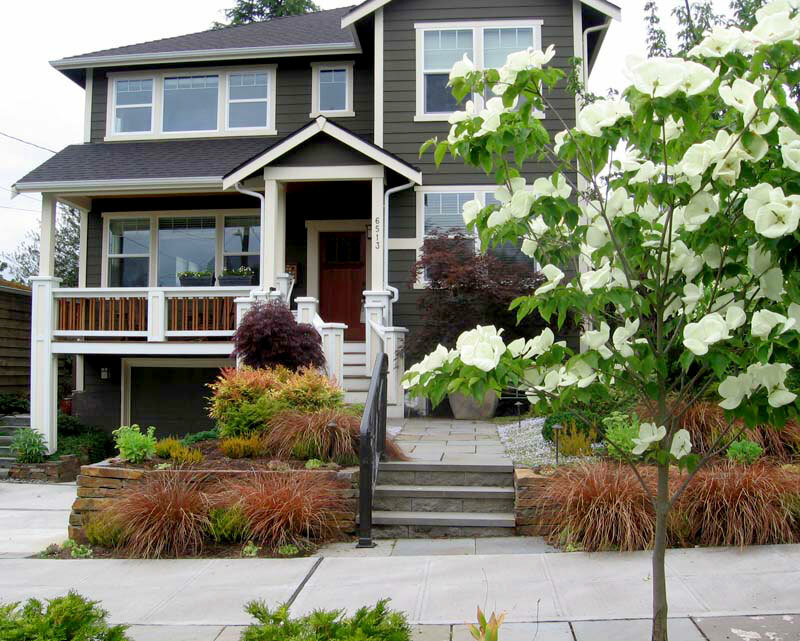 Several inspections—an arborist’s risk assessment report, a geotech’s soil assessment report and approval from the Washington Department of Fish and Wildlife—finally yielded the permit. 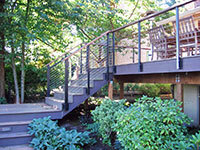 Deck expansion at close proximity to a steep slope also required a permit and several layers of inspections and approvals. This was a slow, arduous process, and I was grateful for patient clients. With all permissions granted I focused on developing the design. Bringing functionality, as well as aesthetics, to the narrow, sloped backyard was the top design priority, along with replacing the deck. Connecting the borrowed view of the lake to the house and property was important in making the new landscape and deck feel as if they belonged there. 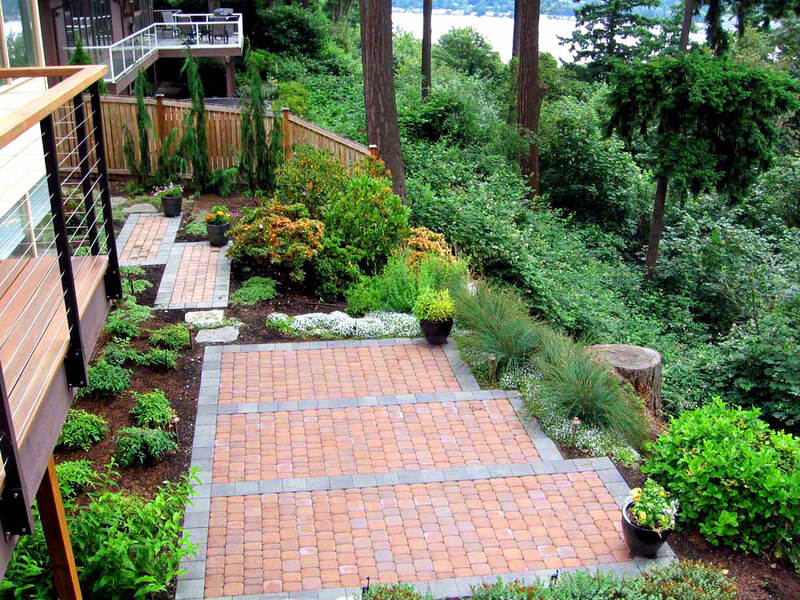 Plant material that themed the natural Northwest setting—conifers, azaleas and rhododendrons, ferns and other shade perennials—made this connection and also satisfied the low-maintenance agenda. 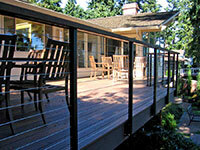 The deck provided the best vantage point to enjoy the view. 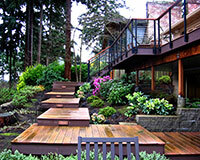 The deck depth was extended four feet to better accommodate dining and entertaining, and the larger-scaled deck nicely connected the house and yard. 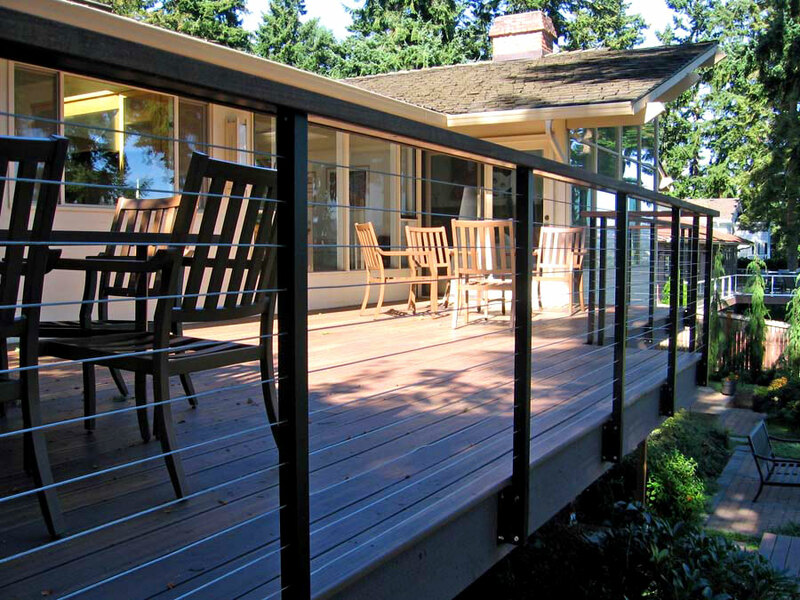 A post and cable railing system with ipe trim detail was used to maintain open sight lines to the view and repeat an interior architectural feature. 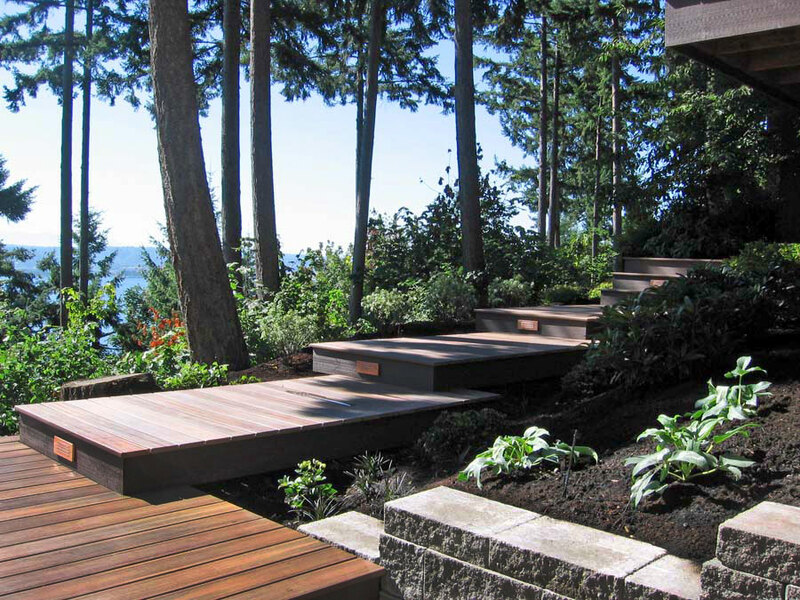 Now, platform risers connect the deck to the patio below and the garden beyond. The descent takes you from an expansive view of the lake, through an azalea and rhododendron garden underplanted with Hellebores, Astilbe ‘Rheinland’ and Ophiopogan planiscapus ‘Nigrescens’ bordering the steps, to an intimate patio surrounded by flowering shrubs, Juncus patens ‘Elk Blue’, and Leptinella squalida. Tricyrtis ‘Samurai’ edges the bed between the patio and house. The patio is sited next to the already existing gas grill so Mark can visit with guests while he cooks, and it also provides an area for dining and entertaining as well as bird watching. 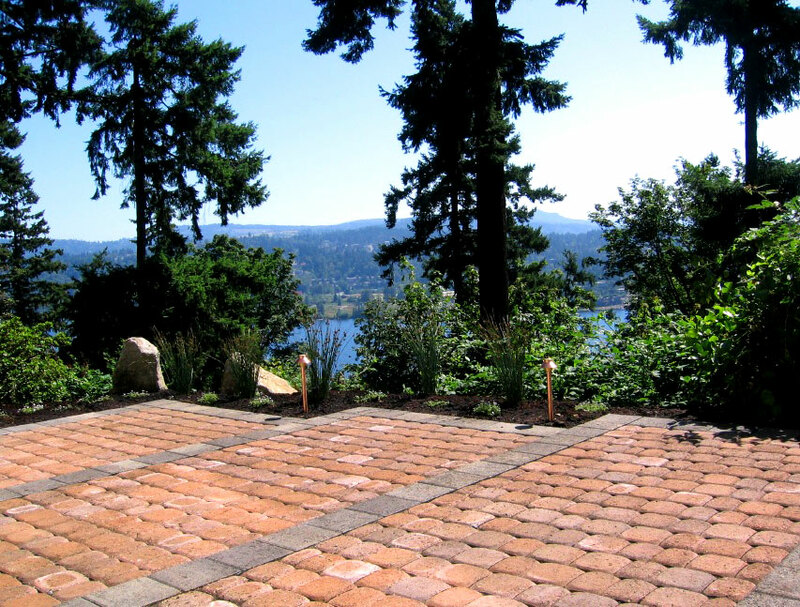 The paver patio is detailed with a stepped-down edge that follows the contour of the terrain; landscape lighting adds evening ambience. Beyond the patio is another azalea and rhododendron garden that terminates at the north fence, which is screened with Chamaecyparis nootkatensis ‘Green Arrow’, a graceful, pendulous conifer that provides a soothing contrast to the strong vertical element of massive tree trunks. 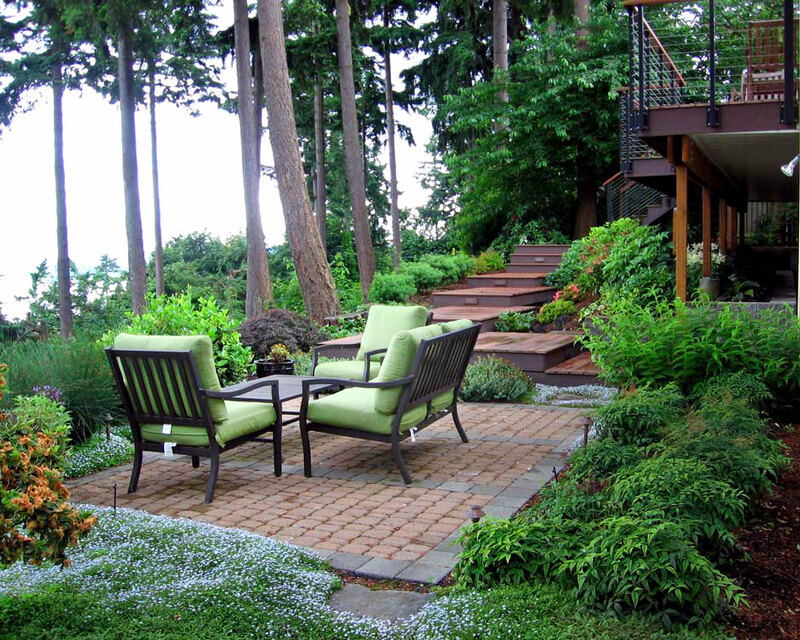 Mark and Debi launched this project to replace a deck, but the patio earned their award for favorite part of the landscape. 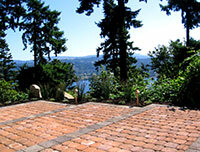 The patio is now the heart of the garden for gathering, entertaining, casual dining and relaxing. Sitting on the garden-surrounded patio with 100-foot-tall conifers only a few feet away is humbling; eagles and herons are protected residents. Salal, sword ferns and other northwest natives connect the trees and complete the lush environment that surrounds the lake. This project is one of my all-time favorites. Creating a landscape that is respectful of the environment but also serves the needs of my client was a satisfying design journey.